According to highly-placed military sources, the unscheduled meeting between the president and the army chief took place amid media reports that Musharraf was flexing his muscles to replace General Kiyani with one of his confidants to tilt the balance of power in his favour. Kiyani has been adamant to keep the institution of the Army neutral in the ongoing confrontation between Musharraf and Zardari. The meeting on Wednesday night went on post midnight and lasted for more than three-and-a-half hours. Their longest ever one-on-one encounter, which is significant in view of the current political and security situation in the country, gained further importance as it took place after day-long consultations of the incumbent COAS with his corps commanders. "... President Musharraf’s spokesman General (Retd) Rashid Qureshi says his boss has no intention of leaving, but given the public perception of his days in power, it would be advisable for him to reconsider. A stock-taking of how successful he was and how many mistakes he made while in power has been done elsewhere. It is now time to take the big decision. After all, no job is forever. And no contract for a job is ever iron-clad." The landscape remained like that for hundreds of miles until we reached Aab-e-Gum, a small station in Baluchistan. The scenery and feeling there was like that of being at a hill-station. The sun had set and it was quite pleasant there. Signs of greenery, seen after hundreds of dry miles, were very refreshing. A young boy with green eyes, golden brown hair and very fair complexion entered the train selling dates in a beautiful hand-made packet made of dried date-leaves saying 'pahari khajor le lo'. Each packet had a dozen dates and all it cost was Rs. 5 ! We could not really pronounce, '', the name of the place as written on the sign board of the station thus asked this boy. He replied innocently, "yahan pani nahe hota na is liye isko Aab-e-Gum boltay hain." When asked how they get water then, he replied, "jab pani bilkul nahe hota to water aata hay". "wo truck atay hain peso kaa water detay hain", he said when he was asked where does that 'water' come from. Baluchistan, as I saw it! On the WSJ under Murdoch: Tuesday, it published yet another Islamophobic rant by its Global View columnist and former Jerusalem Post editor, Bret Stephens, comparing the recent guidelines by the departments of Homeland Security and State on the possibly counter-productive use of politically and religiously provocative words in the "global war on terror" with George Orwell's "Newspeak". Human Rights Report Blasts "Hollowness of the U.S. Administration's Call for Democracy Abroad"
Pre-Iraq War Coverage: "Pretty Good Job" or "Embarrassing?" Poisonous Legacy: Is Dow Chemical Liable for Bhopal? 6 most frequently quoted bullsh*t statistics. Scott McClellan, former chicken, reincarnated rooster, crowing up the sun...which blasts light, as it was destined to do, on the most sludge-laden White House of all time (the fact that he, McChicken, was responsible for much of it notwithstanding). The Bush administration, seen to be a lock-stepping death machine, still in lockstep, responds by saying it is "puzzled." No doubt. That stuff can really clog your brain. PS: Er, fraud...impeachable, eh? The mongoose wrote "A House for Mr Biswas"
This is a transcript taken from Derek Walcott's reading and while we've made every effort to report it accurately, the original may not look like this in terms of layout, punctuation etc. In response to the collapse of the credit and speculation boom, the Fed has set a deliberate re-inflationary objective in order to reverse falling asset prices. It has aggressively resumed its expansionary monetary policy since August 2007, cutting the federal funds rate from 5.25% to 2% with a consequent faster expansion of money supply, resulting in a rapidly depreciating dollar and disrupting stability in commodity markets, propelling oil prices from US$65 to $135 per barrel. Bulldozed: "Now we have nothing left"
The full-frontal foreign policy debate gets hotter everyday. McCain thinks there are votes in attacking Obama as "anti-war." These new pieces for The New Yorker are about where that connects with Bush and how that winds up conferring bona fides on Obama in his nomination fight. The print piece is an homage to Diane Arbus' Boy With the Straw Hat. The movie is our special recipe for egg salad. Hanoch Piven calls it "disgusting." Serge Bloch agrees. Well, none of these people have actually tasted this. Maybe that's a good thing! Must Read: 10-minute office workout to stay fit! THIS book fills a void in the literature on Mohammad Ali Jinnah and his wife, Ruttie, and fills it most admirably. Hitherto, a memoir by Kanji Dwarkadas, a devoted friend of the couple, held the field. It was a slim volume of 63 pages published by the writer himself in 1963 Ruttie Jinnah – The Story of a Great Friendship. It contained interesting letters, including some from Ruttie. Kanjibhai, as he was called, was a follower of Annie Besant and wa s Secretary of the All India Home Rule League when she was its leader and Jinnah its president in Bombay. He was active in the labour movement and wrote two volumes of memoirs, India’s Fight for Freedom and Ten Years to Freedom. Opposed though he was to the partition, he never wavered in his affection for Jinnah, for which another friend, Sardar Patel, teased him often. Rutten Bai, daughter of Sir Dinshaw Petit, Baronet, married Jinnah on April 19, 1918, after she converted to Islam. She was 18 and he was 42. She died on her 29th birthday in early 1929, a few months after they separated. Ruttie was intelligent beyond her years, refined and cultured. An ardent nationalist and a devoted wife, she would be seen in the Visitors Gallery when Jinnah was due to speak and was present in the High Court when Jinnah defended one of the accused in the famous Bawla Murder case. Intizar Hussain's Basti by Frances W. Pritchett. The following is an excerpt from the introduction to Intizar Hussain's Basti by Frances W. Pritchett. She is a lover of Hindi and Urdu literature and her "A Desertful of Roses" site, commenting on Ghalib's ghazals and couplets is in a league of its own. If you want to read her translation of Basti, click HERE. Intizar Husain chose to call his now-famous novel Basti, a word that can refer to any place where groups of people live, from a neighborhood to a city. The novel itself is full of towns, including not only present ones in Pakistan and India, but also at least one from the past (the Delhi of 1857), some mythic ones from Muslim and Hindu story tradition, and two invented ones, Rupnagar and Vyaspur. Although all the outward events clearly take place during Zakir's adult life in Lahore, Lahore is never identified by name -- it remains "this city" from first to last. And the inward events take place in Zakir's memory and imagination alone, as he moves among the times and places of his personal and cultural history. The author has in some cases blurred the transitions. I have tried to clarify them a bit by providing breaks in the text to show movements in time and place, and using " . . . " where fantasy passages begin. Parts of Chapters Seven, Eight, Ten, and Eleven include fantasy and tangled thoughts. While I have provided footnotes identifying quotations and references, the tangle itself is part of the writer's artistry. Some Pakistanis have criticized my choice of this novel, on the grounds that it offers a "negative impression" of their culture, a mood of "nostalgia." Certainly Basti has been controversial; and certainly it is nothing like a definitive, complete picture of modern Pakistan. But surely no intelligent reader will expect it to be. Self-critical literature is one mark of an open and confident society; sophisticated literature is one mark of a rich and healthy language. Basti is not a perfect novel, but it is a fine one, and revelatory, and very powerful at its best. I hope it will become part of a growing repertoire of good Urdu novels translated into English; there are a number of promising modern works that would well repay the translator's efforts. I am grateful to Professor Muhammad Umar Memon of the University of Wisconsin, who proposed this project. For insight into the Urdu text I thank Professor Razi Wasti, former Qaid-e Azam Visiting Professor at Columbia University, who answered many questions; Janab Qamar Jalil of the Berkeley Urdu Language Program in Pakistan, who had previously compiled a useful serial glossary; and my students at Columbia, who read parts of the novel with me and shared their thoughts and feelings about it. My special thanks go to the author, Intizar Husain, for his kindness and patience with my many questions during my visit to Lahore in 1988. For valuable comments on the translation as a work of English prose, I am indebted to my teacher and friend C. M. Naim of the University of Chicago, to my friends David Rubin and Jennifer Crewe, and especially to my mother, who is a superb grammarian and detector of small errors. All the calligraphic designs that appear in the book were generously provided by my friend Adil Mansuri. Chapter One of the novel recently appeared in Edebiyat, and I thank the editors, Michael Beard and Julie Meisami, for their comments and encouragement. Above all, I am deeply grateful for the help of my best friend and collaborator, the distinguished critic Shamsur Rahman Faruqi, who listened to me read my whole draft aloud while he compared it with the original. His comments not only saved me from numerous mistakes, but immeasurably increased the subtlety and depth of the translation. I have had the best possible help in this task, and any errors that remain are mine alone. What can you explain that you didn't set out to explain? What did you discover that you didn't set out to discover? In 1938, 27 year old Roy Plunkett set out to invent a new refrigerant. Instead, he created a glob of white waxy material that conducted heat and did not stick to surfaces. Fascinated by this "unexpected" material, he abandoned his original line of research and experimented with this interesting material, which eventually became known by its household name, "Teflon." The Creative Accident: Are You Looking for the Unexpected? WSJ Asks: Do The Rockefellers Still Matter? Whatever Happened With the Jena 6? Were Buddhists and Jains Persecuted in Ancient India? This Memorial Day remembering Marine Lance Cpl. Jeff Lucey who was lost to his family, friends, and the rest of us fighting the war that stayed in him after Iraq. The anguish, pain, and suffering resulting from this war continues to afflict 300,000 veterans every day. One hundred twenty take their own lives every week. To a very great degree vets are left to their own devices to cope with this and related illnesses. These American patriots need to be put at the top of the list, shown the way out of PTSD to the mental health services they desperately need. Jeff’s pain was unrelenting, although hidden. He did relate his stories in letters. He claimed to have been ordered to shoot two Iraqi soldiers at point-blank range. He anguished over their age and the moral depravity of war. He took their dog tags and wore them himself. He took his own life June 22, 2004. Will Cheney get his war? Emran Qureshi and Heba Raouf Ezzat - Are Sharia Laws and Human Rights Compatible? Osama in White House Basement? If it weren’t for the landmines, Lingapura would be a great place to dig. For part of the 10th century, this pocket of northwestern Cambodia was the capital of the famed Angkorian empire, a sprawling city studded with homes, irrigation channels, and more than 1,000 temples crowned with stone lingam, or phalluses. But ever since Pol Pot and the Khmer Rouge dotted Cambodia with millions of landmines in the 1970s, Lingapura’s ruins have sat mostly untouched. For Damian Evans and Bill Saturno, now surveying Lingapura from atop a crumbling 1,000-year-old tower, the mines don’t really matter. Evans and Saturno are among a growing group of archaeologists who use radar, satellite imagery and other advanced technologies to uncover the mysteries surrounding ancient civilizations. This young vanguard of scholars explores not only regions where violence rules out groundwork, but also sites previously invisible from the ground: the ocean floor, dense jungle, even buried cities. They are transforming archaeology from a gritty, hands-on profession into an office job—what NASA terms, in program-funding documents, “space archaeology.” In doing so, they’re unearthing whole civilizations and rewriting history books: reshaping, in a few short years, the study of our preindustrial past. The Colbertian Guide to Foreign Policy Coverage. 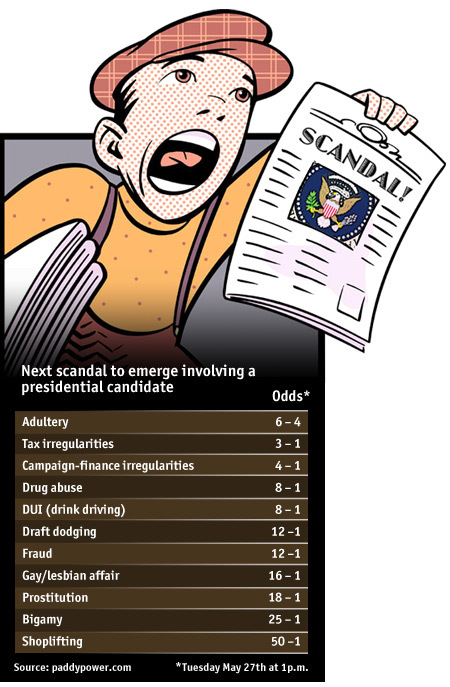 The Dirty Trickster: Campaign tips from the man who has done it all. US and Iran: Is an Iraq grand bargain possible?